It’s been 28 years since the Americans with Disabilities Act (ADA) was passed by Congress. The United States has come a long way in addressing the needs of those with disabilities. Yet, for some, like Alison Chancellor and Kiel Eigen, the struggle for equality persists in other ways. I live in a big city in Missouri, and I consider myself luckier than most. I live in an apartment building that is universally designed. Both people with and without disabilities can enjoy all the building’s conveniences, like using the dishwasher or accessing on-site laundry. Public transportation, however, is a different story. I don’t drive a car, so my ways of getting around are limited. I rely on the light rail system and a call-a-ride service. The light rail is useful for getting downtown, but other areas requiring driving to access the stations. I’m fortunate that I can access my station because it’s close to my home. I use it as much as I can. The call-a-ride service is another good option. 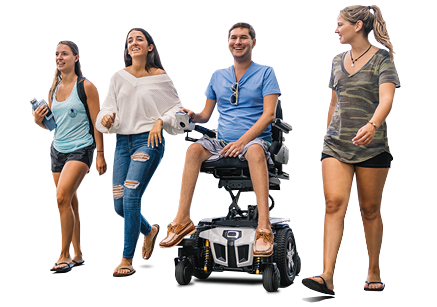 This door-to-door service is available to persons whose disabilities prevent them from using regular, accessible, fixed-route transit services. It’s available to non-disabled persons as well. Still, the call-a-ride service has its downsides. I am forced to plan 3-4 days in advance, and there’s a 15-minute window on each side of the reservation. Regardless of the weather, I must wait for the van at that time, otherwise they leave you behind after 5 minutes. Public restrooms are another problem. While visiting a popular tourist destination, I needed to use the bathroom. It had a small doorway and no handle bars. I needed help throughout the entire process. It was embarrassing, to say the least. The wait for accessible transportation seems to be an ongoing problem. I have traveled to large cities and spent a lot of time waiting for a taxi pickup. When the cab finally arrived, most of the drivers did not know how to unfold the wheelchair ramps! In New York City alone, there are approximately 90,000 wheelchair users. It’s clear that many metropolitan areas are still working to implement a system that meets the needs of wheelchair users like me. And sometimes, it takes legal action to get a city to do something. As part of a settlement in a discrimination lawsuit, New York City has agreed to make half of its 13,000 yellow cabs wheelchair accessible by 2020 (https://www.nytimes.com/2018/01/24/nyregion/accessible-taxis-disabled-nyc.html). Finding handicap-accessible bathrooms in a large city is a total nightmare. One bathroom was so small that an able-bodied person could barely fit inside, let alone me and my power chair. The ADA prohibits discrimination against individuals with disabilities in all areas of public life, including schools, jobs, transportation, and all places that are open to the public. These places must provide reasonable accommodation for persons with disabilities, however, ‘reasonable’ is open to interpretation. Plus, what might be reasonable for someone like me may not be reasonable for another, depending on his or her disability. Even with the ADA behind me, there are some aspects of my life that are challenging. If there is one thing I’ve learned, it’s that you must fight for your needs. I have fought tooth and nail, and advocated for everything I have. And if you need help learning how, ask.